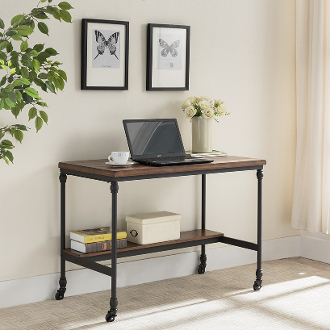 The Covington Wooden & Metal Desk with Charging Station is a simple, rustic, design that is highlighted with a charging station. The size and its mobile design make it a versatile piece for any room. It can be used as a writing desk, computer desk, or a work table. The charging station will allow you to conveniently charge your electronic devices. The top is made of solid wood, MDF and wood veneer. The legs and frame are made of metal with a black finish. The charging station has 2 power outlets and 2 USB ports. The power cord is 10' long. Dimensions: 42"W X 22"D X 30"H. Easy Assembly is required.